DreamFace is a cloud based development platform that accelerates UI development, simplifies APIs consumption and eases deployment of cloud web and mobile apps. 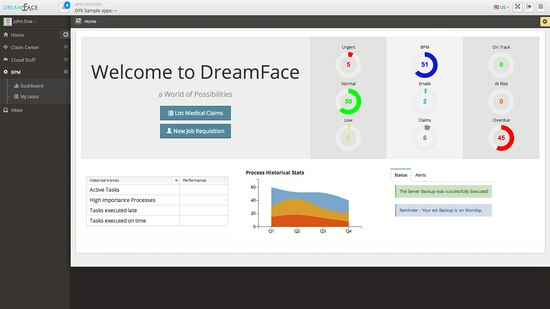 DreamFace is a cloud-based development platform that delivers enterprise-grade cloud applications – from development right in the browser to deployment on Web or Mobile with just a click. A team with blended skills can produce Internet Web applications quickly and easily – combining a rich UI, importing and consuming any public or private API, and respecting enterprise-standards for security, scalability and manageability. DreamFace is a cloud-based development platform that empowers developers to deliver uncompromised User Experiences for Web or any Mobile device in just a few clicks. Visual Development, Codeless API integration, Responsive Web & Mobile, Built-in Devops, One Click Deployment, Containerization, Load Balancing across clouds all at your service to ensure best results. Leverage the blend of skills on your team, from internet web to enterprise developers, by arming them with a tool that supports each developer's strength and makes the whole team more productive. 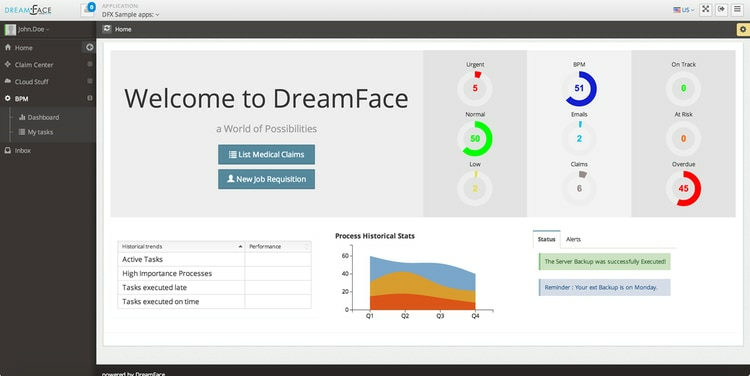 UI for the API & Microservices Economy: DreamFace can consume any API and generate the data without coding. The API is bound to the UI component to create a data-enabled View. Views are assembled in Pages to create composite applications. Easy Angular and Node App Development: DreamFace has Visual editors and built-in best practices to leverage Angular and Node to build data-enabled, UI components that can be reused across applications or deployed as standalone APIs. Building Visual UI for BPM: The DreamFace cloud development platform includes extensive built-in accelorators to speed development and ease deployment of composable BPM-enabled Web and Mobile applications to the Bluemix cloud. Build Enterprise Apps for IBM BlueMix: DreamFace empowers you to create composite applications that integrate any Bluemix service. There are no uploads or downloads and no need to provision test or runtime environments outside of BlueMix.